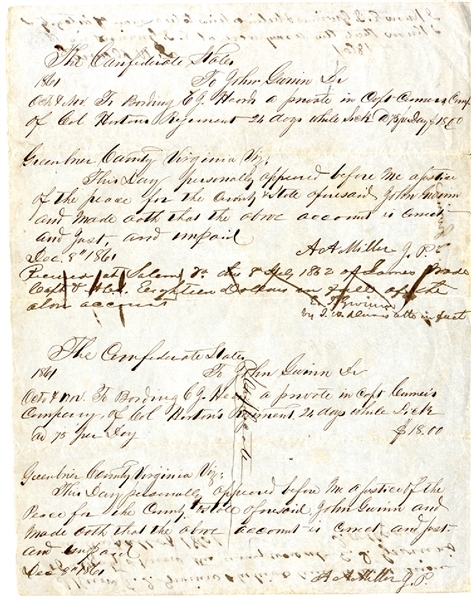 Confederate Document Signed, 1pp, quarto, December 8, 1861, stating that John Gwinn of Greenbrier County, Virginia, was due $18 for “Boarding C.J. Heard a private in Capt Conner’s Company of Col. Herton’s Regiment.” Fine condition. During the secession crisis of 1861 Greenbrier citizens chose Samuel Price as their delegate to the Richmond convention. On April 17, 1861, the day Virginia's secession ordinance was passed he voted against it, but later changed his mind and signed the official document. When the public vote on the secession ordinance was held on May 23, 1861, Greenbrier County voted 1,000 to 100 in favor of secession. The Civil War came to the county in mid-1861, and several battles were fought in the area, including Lewisburg in May 1862 and White Sulphur Springs in August 1863.